When reviewing the Job dashboard you will notice that it is quite similar in appearance to the Quote dashboard. Yet some features from the Quotational section are not present in the Job section (such as Clauses and Provided by), while there are other features and functionalities specific exclusively for this particular stage of the business process (such as Scope). 1. OVERVIEW – this portion of the Job dashboard copies the contents from the Quote overview section. This is the list of all services and items offered and approved for delivery. 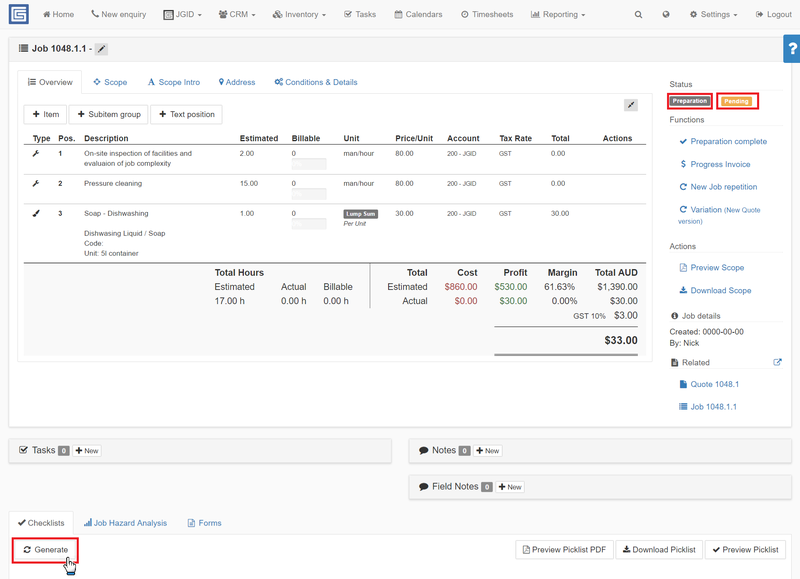 Note you can change the contents of this section by adding and removing items, alter descriptions, quantities, pricing etc. You can edit the Job picklist generated from the Checklist Generate button as well as generate and edit the JHA section of the Job. You can upload a list of company approved and relevant to the work process forms, accessible to the field staff through their mobile devices. Bear in mind that the features accessible through the Overview panel of the Job dashboard will increase once the Job is started and the Status changes from Preparation and Pending to Current. (See the “Job statuses explained” article). Once the job commences you will be able to see and review the Worksheets, the Timesheets and the DLS forms submitted by the field staff throughout the work process. 2. 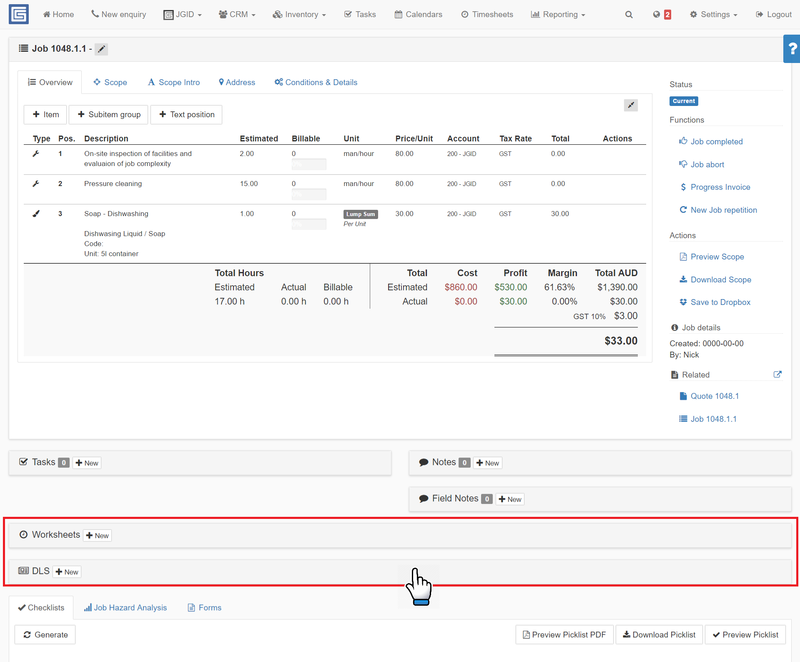 SCOPE – This tab panel, copies the description text of the listings into the Overview section, however, it does not transfer any prices, quantities or other numerical details about the job. This section contains solely the description of services and items subject to delivery. This information will appear on the mobile devices of the team members on-site, when you schedule the job into their Calendars and allocate them to it. The purpose of this feature is to keep any of your company pricing strategies confidential, yet, should you decide to share this informaion with the workers, you can always edit the text of the listings into the Scope panel. To do so, click on the blue edit pen icon to edit either the Description or the Comments secton of the Scope. Pay attention to the Copy Description button. If you make a change to the Overview list of items and services, copied initially into the Job Overview section from the Quote you have made, then in order to have the changes transfered to the Scope description Section, you need to click on the Copy Description Button to confirm the change. This is an extra level of authorization, to make sure no acciental and unapproved changes are made to the scope of work, which the field staff refers to when working on the job.